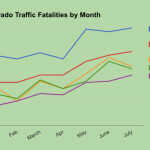 Traffic fatalities decline when cannabis use rises? At the beginning if the year, cannabis was re-legalized in Colorado. 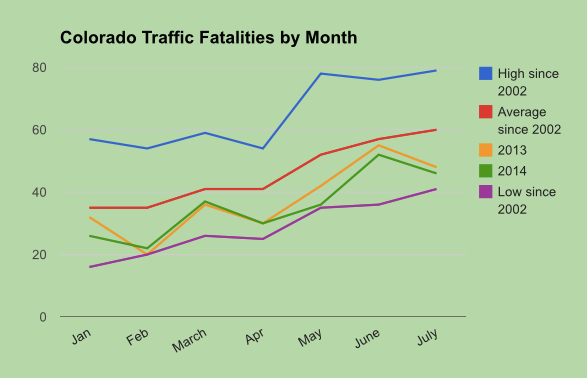 Those opposed to the move predicted dire results for the Rocky Mountain State, including increased usage and a rise in stoned drivers causing an increase in traffic fatalities. However, the media reports of this accident didn’t mention alcohol as being involved. Could it be that the media reports, which included briefings by the police, were being written in a way to further an agenda? Could it be that because alcohol has been legal longer, and is more accepted, that the media decided to gloss over a drunk-driving accident to perpetuate the myth of the danger of stoned-drivers? Some have called for a zero-tolerance policy, saying the 5 nanograms of THC per milliliter of blood is too permissive. There is however a problem with zero-tolerance. Despite such a policy being thrown out in Arizona, it would essentially mean that anyone who uses cannabis on a somewhat regular basis would be prohibited from driving even if they are not high. Could you imagine the outrage if a legislator proposed prohibiting drinkers or tobacco smokers from driving if those substances had been used in the previous 2-4 weeks? One thing is certain, if no one were allowed to drive, traffic fatalities would approach zero! There is more than a little truth in the old joke “a drunk runs stop signs, a stoner waits for them to turn green”. The thing is while freaked out paranoia on the road isn’t a good thing, it DOES tend towards safer drivers: most traffic accidents typically involve one driver thinking they can do no wrong, paranoids know better. I do kind of foresee a slight increase in secondary traffic accidents, those in which a hurried driver does stupid things to avoid a less-than-hurried driver and hits a third car/bikeped/object, but that should be much less than the decrease that we’re seeing here. Come on, don’t you know that cannibis makes you a violent driver that turns a racing game into reality where you get points for running over anyone on the track. Oh wait, I was reading sprint car racing news.